The main contributions of this research are summarized as follows: – In this research, we propose a new architecture of encrypted file system based on a high performance distributed key-value store and Advanced Encryption Standard (AES). The product of this research is called KVEFS which is used in a linux distribution called mtaOS. – This architecture is more flexible than existing solutions. Users can choose various underlining key-value store in the same host or from remote host. – This research can help user to protect sensitive data in both local disk or remote machine. The directory structure is secured and hidden in key-value stores. The rest of this paper is organized as follows: Section 2 presents basic knowledge to build our systems like libfuse, key value store and openssl. Section 3 introduces the study of fs encryption used in linux. The design and implementation of KVEFS on linux platform are shown in Section 4. In Section 5, we setup test-cases with different key-value store to evaluate KVEFS filesystem used in linux. Section 6 concludes the paper. useful for writing virtual file systems. The virtual file systems don’t store data themselves. They are implemented as a transformation of an existing file system. In principle, any resource available to a FUSE implementation can be exported as a file system. without transfering via network. Therefore, the use of symmetric encryption is safe enough for the system. We use AES[13, 3] encryption algorithm. AES is based on a design principle known as substitutionâ&#x20AC;&#x201C;permutation network, and is fast in both software and hardware. 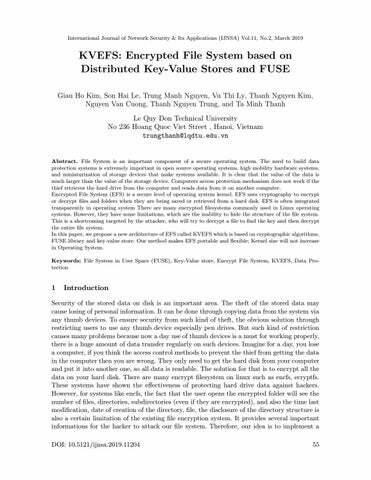 This paper introduces a new architecture for building encrypted file system using FUSE, high performance distributed key-value store and the AES encryption algorithm. We also show you how to manage the key by saving the hash directly to the database, changing the password without having to re-encrypt the entire data to avoid I/O overhead time. With KVEFS, endusers can have new choice of encrypted file system to protect sensitive data, the directory structure is secured and hidden when storing in key-value store. KVEFS can be a component of a secure operating system. In our future research, we will continue to develop this idea for file encryption in cloud storage, integrate with more block cipher algorithms, improve performance and try to optimize for big files. References 1. MICHAEL ABD-EL-MALEK. File system virtual appliances. Dept. of Electrical and Computer Engineering Carnegie Mellon University, 2010. 2. Erez Zadok Bharath Kumar Reddy Vangoor, Vasily Tarasov. To fuse or not to fuse: Performance of user-space file systems. USENIX Conference on File and Storage Technologies, 2017. 3. Joan Daemen and Vincent Rijmen. The design of Rijndael: AES-the advanced encryption standard. Springer Science & Business Media, 2013. 4. SZMI et al. File system in user space. 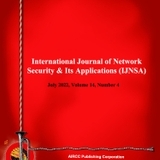 URL: https://github.com/libfuse/libfuse, 2011.
International Journal of Network Security & Its Applications (IJNSA) Vol.11, No.2, March 2019 5. Siyu Chen Mengwei Hou Jeong-Uk Kang Sangyeun Cho Fei Yang, Kun Dou. Optimizing nosql db on flash: A case study of rocksdb. 2015 IEEE 12th Intl Conf on Ubiquitous Intelligence and Computing and 2015 IEEE 12th Intl Conf on Autonomic and Trusted Computing and 2015 IEEE 15th Intl Conf on Scalable Computing and Communications and Its Associated Workshops (UIC-ATC-ScalCom). 6. Sanjay Ghemawat and Jeff Dean. Leveldb. URL: https://github. com/google/leveldb,% 20http://leveldb. org, 2011. 7. Valient Gough. Encfs encrypted filesystem. Located at: https://github.com /vgough/encfs, 13:22, 2003. 8. Michael Austin Halcrow. ecryptfs: An enterprise-class encrypted filesystem for linux. In Proceedings of the 2005 Linux Symposium, volume 1, pages 201–218, 2005. 9. Yulong Zhao Dingzeyu Wu Chengrui He Lei Wang, Guiqiang Ding. Optimization of leveldb by separating key and value. 2017 18th International Conference on Parallel and Distributed Computing, Applications and Technologies (PDCAT), 2017. 10. Thanh Trung Nguyen and Minh Hieu Nguyen. Zing database: high-performance key-value store for largescale storage service. Vietnam Journal of Computer Science, 2(1):13–23, Feb 2015. 11. Thanh Trung Nguyen and Minh Hieu Nguyen. Forest of distributed b+ tree based on key-value store for big-set problem. In International Conference on Database Systems for Advanced Applications, pages 268–282. Springer, 2016. 12. Colin Percival and Simon Josefsson. The scrypt password-based key derivation function. Technical report, 2016. 13. NIST FIPS Pub. 197: Advanced encryption standard (aes). Federal information processing standards publication, 197(441):0311, 2001. 14. Zhi Hao Wu. A log-structured file system based on leveldb. In Applied Mechanics and Materials, volume 602, pages 3481–3484. Trans Tech Publ, 2014. File System is an important component of a secure operating system. The need to build data protection systems is extremely important in open source operating systems, high mobility hardware systems, and miniaturization of storage devices that make systems available.